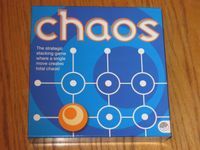 There appear to have been two versions of Chaos, both with copyright dates of 2007. One with a brown board, one with a blue board. The picture on the back of the box apparently matches what is inside.